人 IGF1 ELISA Kit | ABIN491762 Product No. 原理 The Chemiluminescent Immunoassay kit is designed for the in vitro sensitive quantitative measurement of IGF1 in human serum, plasma and other biological fluids. This assay has high sensitivity and excellent specificity for detection of Insulin Like Growth Factor 1 (IGF1). No significant cross-reactivity or interference between Insulin Like Growth Factor 1 (IGF1) and analogues was observed. 交叉反应 （详细） No significant cross-reactivity or interference between Insulin Like Growth Factor 1 (IGF1) and analogues was observed. Luminometer capable of reading 96-well microplates with the following parameters: lag time 30.0s, read time 1.0 s/well . Precision single or multi-channel pipettes and pipette tips with disposable tips. Standard - Reconstitute the Standard with 1.0 mL of Standard Diluent, kept for 10 minutes at room temperature, shake gently(not to foam). The concentration of the standard in the stock solution is 160ng/mL. Please firstly dilute the stock solution to 40ng/mL and the diluted standard serves as the highest standard (40ng/mL). Then prepare 7 tubes containing 0.5mL Standard Diluent and use the diluted standard to produce a double dilution series. Mix each tube thoroughly before the next transfer. Set up 7 points of diluted standard such as 40ng/mL, 20ng/mL, 10ng/mL, 5ng/mL, 2.5ng/mL, 1.25ng/mL, 0.625ng/mL, and the last EP tubes with Standard Diluent is the blank as 0ng/mL. Substrate working Solution - Mix the substrate A and B by the ratio of 99:1 to make the substrate working solution. Mix thoroughly. For example, prepare 1,000µL Substrate working Solution with 990µL Substrate A + 10µL Substrate B. Prepare Substrate working Solution within 15 minutes before assay. 样品收集 Serum: Allow samples to clot for two hours at room temperature or overnight at 4°C before centrifugation for 20 minutes at approximately 1000 × g. Assay immediately or store samples in aliquot at -20°C or -80°C. Avoid repeated freeze/thaw cycles. 1. Determine wells for diluted standard, blank and sample. Prepare 7 wells for standard, 1 well for blank. 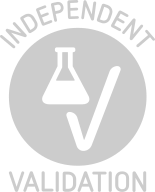 Add 100 µL each of dilutions of standard (read Reagent Preparation), blank and samples into the appropriate wells. Cover with the Plate sealer. Incubate for 2 hours at 37 °C. 2. Remove the liquid of each well, don't wash.
3. Add 100 µL of Detection Reagent A working solution to each well. Incubate for 1 hour at 37 °C after covering it with the Plate sealer. 4. Aspirate the solution and wash with 350 µL of 1× Wash Solution to each well using a squirt bottle, multi-channel pipette, manifold dispenser or autowasher, and let it sit for 1~2 minutes. Remove the remaining liquid from all wells completely by snapping the plate onto absorbent paper. Repeat 3 times. After the last wash, remove any remaining Wash Buffer by aspirating or decanting. Invert the plate and blot it against absorbent paper. 5. Add 100 µL of Detection Reagent B working solution to each well. Incubate for 30 minutes at 37 °C after covering it with the Plate sealer. 6. Repeat the aspiration/wash process for five times as conducted in step 4. 7. Add 100 µL of Substrate working Solution to each well. Cover with a new Plate sealer. Incubate for 5-10 minutes at 37 °C (Don't exceed 10 minutes). Protect from light. 8. Measure the chemiluminescence signal in a microplate luminometer or as appropriate for the instrument used. 1. Assay preparation: Keep appropriate numbers of wells for 1 experiment and remove extra wells from microplate. Rest wells should be resealed and stored at -20 °C. 2. Samples or reagents addition: Please use the freshly prepared Standard. Please carefully add samples to wells and mix gently to avoid foaming. Do not touch the well wall. For each step in the procedure, total dispensing time for addition of reagents or samples to the assay plate should not exceed 10 minutes. This will ensure equal elapsed time for each pipetting step, without interruption. To avoid cross-contamination, change pipette tips between additions of standards, samples, and reagents. Also, use separated reservoirs for each reagent. 3. Incubation: To ensure accurate results, proper adhesion of plate sealers during incubation steps is necessary. Do not allow wells to sit uncovered for extended periods between incubation steps. Once reagents are added to the well strips, DO NOT let the strips DRY at any time during the assay. Incubation time and temperature must be controlled. 4. Washing: The wash procedure is critical. Complete removal of liquid at each step is essential for good performance. After the last wash, remove any remaining Wash Solution by aspirating or decanting and remove any drop of water and fingerprint on the bottom of the plate. Insufficient washing will result in poor precision and false elevated absorbance reading. 5. For Substrate A and B, please protect it from light. 6. 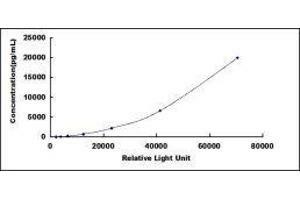 Relative light units (RLUs) may differ from different luminometers.The Immunoassay was optimized using a Beijing Hamamatsu luminometer. Other instruments may require settings to be adjusted. 7. Relative light units may vary within the 10 minute reading window. Average the duplicate readings for each standard, control, and samples and subtract the average zero standard relative light unit (RLU). Create a standard curve on log-log graph paper, with IGF1 concentration on the y-axis and the RLU value on the x-axis. Draw the best fit straight line through the standard points and it can be determined by regression analysis. Using some plot software, such as curve expert 1.30, is also recommended. If samples have been diluted, the concentration read from the standard curve must be multiplied by the dilution factor. In order to make the calculation easier, we plot the RLU value of the standard (X-axis) against the known concentration of the standard (Y-axis), although concentration is indeed the independent variable while RLU value is the dependent variable. Further, in this part, in order to help the customer perform the assay more visual, we provide the customer with the raw data (not the log of data). However, plotting log of the data to construct the curve will be recommended. The RLU values of the standard curve may vary according to the conditions of assay performance (e.g. operator, pipetting technique, washing technique or temperature effects). This curve is provided for demonstration only. The customers should establish their own standard curve for each test conducted. Intra-assay Precision (Precision within an assay): 3 samples with low, middle and high level Insulin Like Growth Factor 1 (IGF1) were tested 20 times on one plate, respectively. Inter-assay Precision (Precision between assays): 3 samples with low, middle and high level Insulin Like Growth Factor 1 (IGF1) were tested on 3 different plates, 8 replicates in each plate. 注意事项 The Stop Solution suggested for use with this kit is an acid solution. Wear eye, hand, face, and clothing protection when using this material. 注意事项 The stability of kit is determined by the loss rate of activity. The loss rate of this kit is less than 5 % within the expiration date under appropriate storage condition.